KDE Plasma does not use overlay scrollbars, but rather solid scrollbars. GTK3's default is to set all gtk3 main app windows and gtk3 dialog windows to use overlay scrollbars. Yet Gtk2 and Qt4 and Qt5 apps are otherwise fully integrated. Much like xubuntu, it would be sensible to disable gtk3 overlay scrollbars in the global settings. KDE Plasma is also unable to integrate gtk3 apps in terms of button placement. The Qt/KDE order is CONFIRM in center, with CANCEL on the right. 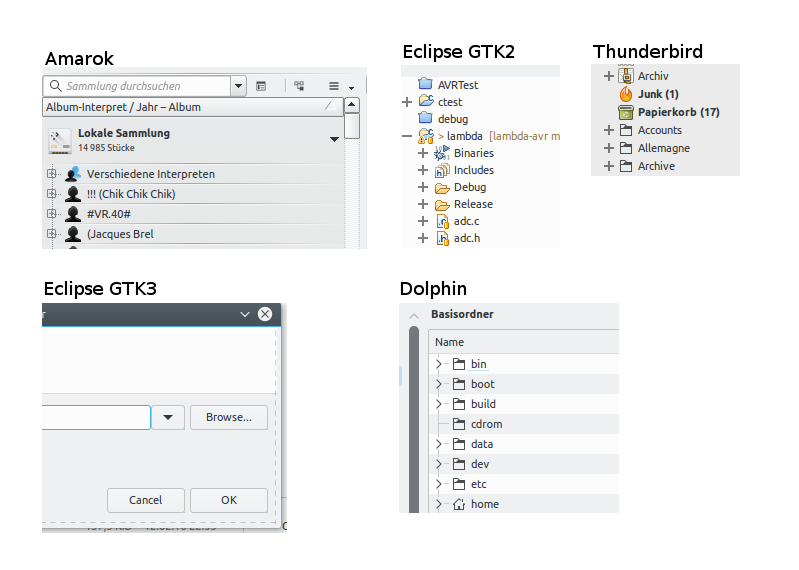 GTK2 apps obey this and adapt for the environment, but gtk3 apps do not obey this. The latter issue is possibly a deeper issue with GTK3 and/or Q5 and/or kde plasma. The former issue is an environment setting (scriptable?). The various Ubuntu flavours are great for being the best showcases of mate/xfce/kde and gnome is getting there. While application choices and selective patching of ui in some apps are not universal, the environments themselves and integration is great. Just reporting this to see this get to that 100% mark in quality. Gtk3 csd apps (see menulibre as one that is not Unity-ified) also lack shadows and corners are off, but better than the boxed bizarreness of simple upstream distros like Arch. Do not install development helper files via cmake. Commit. Let KDE*CompilerSettings change the policies in the project. Commit. Implement changing cursor theme for GTK applications. Commit. I hope it is okay that I add some issues here that I think are related - if not, please let me know and I'll create a separate bug. All of them looked consistent in 15.10 (besides Eclipse with GTK3 which looked kinda broken but looks much better now). Please see attached screenshot incl. one of Dolphin which looks fine of course (tree nodes, scrollbar). Just want to mention that after a recent update the L&F of KDE4 applications like Amarok is consistent again.